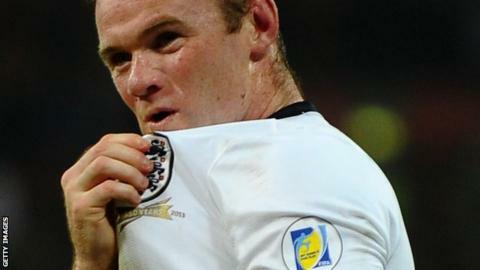 Manager Roy Hodgson is concerned the England captaincy could eventually prove to be a burden for Wayne Rooney. The Manchester United striker, 29, who will win his 100th England cap against Slovenia at Wembley on 15 November, was named skipper by Hodgson in August. England have won all three matches during Rooney's captaincy and are top of their Euro 2016 qualifying group. Hodgson said Rooney has impressed, but added: "I worry that the responsibility is going to weigh him down." The 67-year-old manager continued: "We do all we can, myself and the coaching staff, to ensure that won't happen with us." Rooney inherited the armband from Liverpool's Steven Gerrard, 34, who retired from international football following England's disappointing performance at the 2014 World Cup in Brazil. The former Everton striker, who made a positive impression on Hodgson when they first met, is now the figurehead as England rebuild for the European Championships in France. Hodgson said: "I met a man who was burning to play, and that is the way he has been all along. "Since he has been made captain, I think he has taken an even further step, both at Manchester United and with us." Rooney was made captain of United at the beginning of the Premier League season by manager Louis van Gaal, who also warned of the burden of added responsibility. Hodgson added: "At the moment I think he's coping with it well but we'll have to keep an eye on the situation, as will Louis, to make sure it doesn't weigh him down. "I remember making the point fairly recently that he's really taken on this job as captain with enormous seriousness. "He's studied and talked a lot with Steven Gerrard. He spends a lot of time with the younger players. And obviously with me he's very good. If there's anything he thinks I should be made aware of, he makes me aware of it." Rooney became England's youngest player when he made his debut as a 17-year-old in a 3-1 defeat against Australia in February 2003 and is now ninth in the list of most capped players. And Hodgson believes Rooney could play on until his mid-30s and overtake Peter Shilton's 125 appearances at the top of the list. He said: "If we are generous and give him another five years, which is not beyond the bounds of possibility, he should beat Peter's record." Rooney is also just six goals behind Bobby Charlton's England record of 49, but Hodgson does not believe that is his captain's focus. "I'm not certain Wayne Rooney is a person who goes to bed at night dreaming of a record," Hodgson continued. "I believe he just wants to keep playing and do the best job he can for England for as long as possible." If England beat Slovenia in next Saturday's Euro 2016 qualifier, Hodgson's side will go six points clear at the top of Group E.